› College Football Playoff › Alabama vs Clemson Championship Game Tickets are Historically Cheap, How Low Will They Go? With a get-in price of $126, it is the cheapest National Championship since 2011. That is also cheaper than this year's SEC championship, which had tickets starting at $340. As for how low prices could go, last year's Alabama-Clemson Semifinal matchup dropped 31% in the week ahead of the game, which took place in New Orleans. The cheapest championship game we've tracked prior to this year was the 2017 Alabama-Clemson final in Glendale, Arizona, which had tickets as low as $202. The biggest factor driving down prices is the distance that both fan bases have to travel to get to Levis Stadium in Santa Clara, California. At an average distance of 2,428 from each campus, this is the farthest distance that two teams have had to travel to play in the national championship game this decade, as the below infographic shows. Last years championship game between Alabama and Georgia in Atlanta was the shortest average distance, at 136 miles. 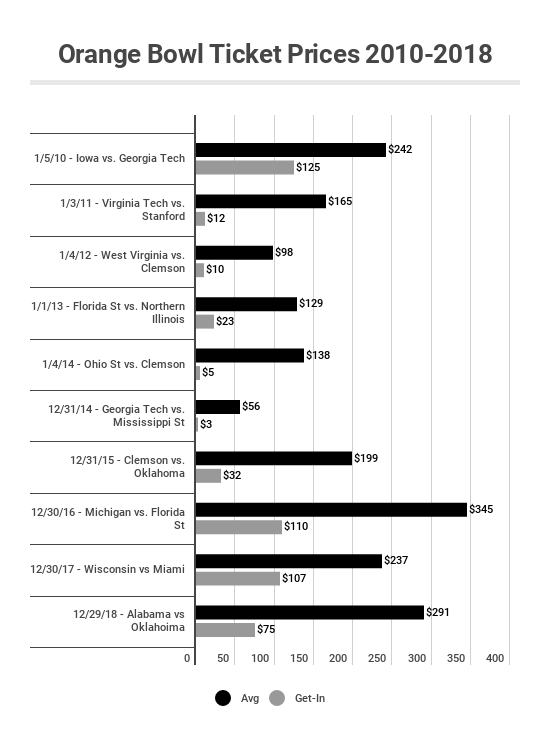 It's not a coincidence that last year was also the most expensive championship game we've ever tracked. In addition to the distance, this is also the 4th consecutive year that Alabama and Clemson have faced off in a playoff, which means there's little novelty, despite compelling matchup. Below is the cheapest ticket for each of the four Alabama-Clemson matchups. According to data from secondary ticket marketplace TicketIQ.com, those two national semifinals will be the priciest of the CFP era. The current average asking price for the Cotton Bowl is $666, followed by $488 for the Orange Bowl. The average asking price of $2,155 for the national championship ranks No. 4 in terms of price since 2011, when TicketIQ.com began tracking data. For the last two years, the CFP title game has commanded big money. Demand for the game reached its pinnacle in 2017-18, according to TicketIQ.com, when fans pushed the average asking price to $4,040. The high price was likely due, in part, to the location of the game, which was at Mercedes-Benz Arena. Hometown favorite Georgia was on one sideline while perennial power Alabama was on the on the other. The next most expensive national championship was also likely a function of location – fans drove the price of the 2010-11 BCS title game up to $2,992 when Oregon played Auburn at the Fiesta Bowl in Phoenix. The 2016-17 title game was ranked No. 3, and fans drove the price for Alabama-Clemson in Tampa to $2,898. The average asking price for the 2018-19 edition has creeped up about $10 since the field was set. But that number could go up … or down … depending on which teams get to the championship. The average asking price for this game has fallen steadily, from a high of $462 in mid-December to $291. At that price, the Orange Bowl would rank No. 6 among CFP semifinal this decade, according to TicketIQ.com. 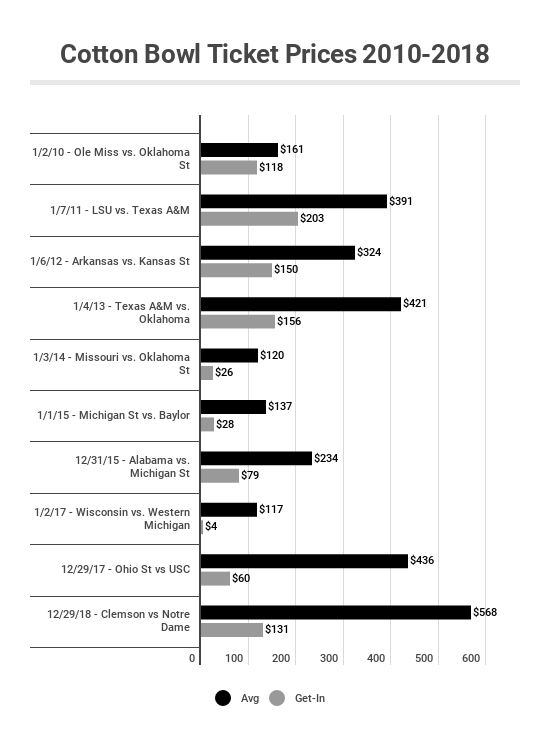 The most expensive is this year’s Cotton Bowl semifinal, which is commanding $568. The second priciest was $422 at the Rose Bowl, when Georgia beat Oklahoma on Jan. 1. The Orange Bowl last hosted a CFP semifinal on December 31, 2015, when Clemson played Oklahoma. Fans paid an average asking price of $199 for that game, according to TicketIQ.com. The get-in price was $32. It was the least expensive semifinal of the CFP era. The next cheapest was $221 when Clemson played Ohio State the following year at the Fiesta Bowl. For two big-time college football programs, these teams have little shared history. Alabama and Oklahoma have played five times, and Oklahoma leads the series, 3-1-1. The last meeting predates the CFP era. Oklahoma beat Alabama, 45-31, in the Sugar Bowl in 2014. The Sooners are currently on a three-game win streak against the Tide. Alabama is making its fifth consecutive CFP appearance and Oklahoma is making its third in five years. At $568, this is the most expensive CFP semifinal in history The 2108 Rose Bowl, when Georgia beat Oklahoma, is the second most expensive at $422. The Cotton Bowl last hosted a CFP semifinal on December 31, 2015, when Alabama played Michigan State. The average asking price on the secondary market, according to TicketIQ.com was $234 and the get-in price was $79. The average asking price for that game was the third cheapest in the CFP era. Clemson and Notre Dame have little history -- the teams have played only three times, and Clemson holds a 2-1 all-time series record. The teams last played during the regular season in 2015, when Clemson held off a furious Notre Dame fourth-quarter rally to win, 24-22. Clemson is making its fourth CFP appearance and Notre Dame is making its first. This game will be the fifth edition of the College Football Playoff championship, which replaced the Bowl Championship Series in 2014-15. Alabama, which is likely to get another shot at a national championship, has played in three of the first four CFP championships and has won twice. This will be the first CFP game played in the San Francisco Bay Area. 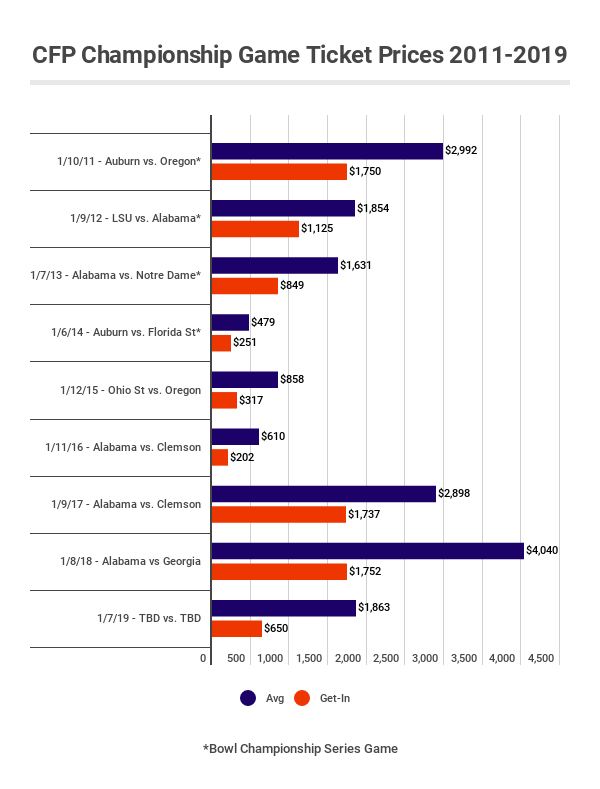 Last year’s game in Atlanta was the most expensive college football national championship since 2011, when TicketIQ.com began tracking data. That game, which featured Alabama against SEC-rival Georgia, settled at $4,040. The least expensive national championship of the decade was the 2014 championship, when fans paid $479 to see Auburn play Florida State at the Rose Bowl. The 2018-19 championship is currently the third most expensive of the CFP era, and fourth most priciest national championship (including BCS games) of the decade.